How do you define your creative practice/business? 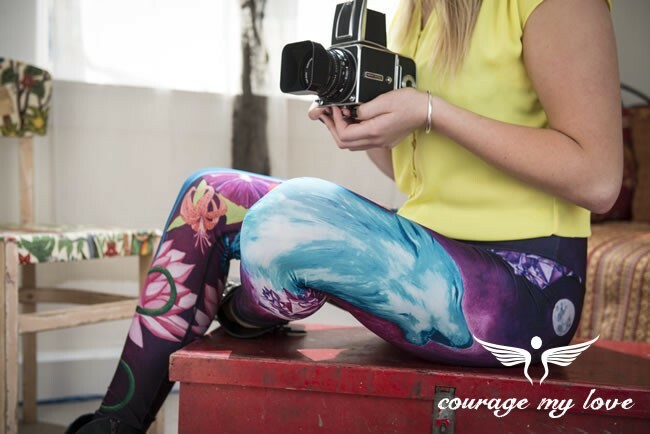 Courage My Love is the active wear brand manufacturing top of the line ‘fitness to fashion’ apparel in Christchurch. Quality technical design meets our local art community by collaborating with New Zealand artists to create the printed patterns onto this cutting edge apparel. My work is to inspire and to be inspired. That is the seed of it, but what grows from that has an impact on both my personal and professional life. That is why I chose to do the things I love, so I can enjoy life and the fruits of my labour! I started teaching yoga 5 years ago, at the time hot yoga was all the rage, and there was not a lot of technical yoga gear. Today the market is flooded with options, but Courage My Love is really niche because of the superior quality, technical function and most of all the artistic expression. 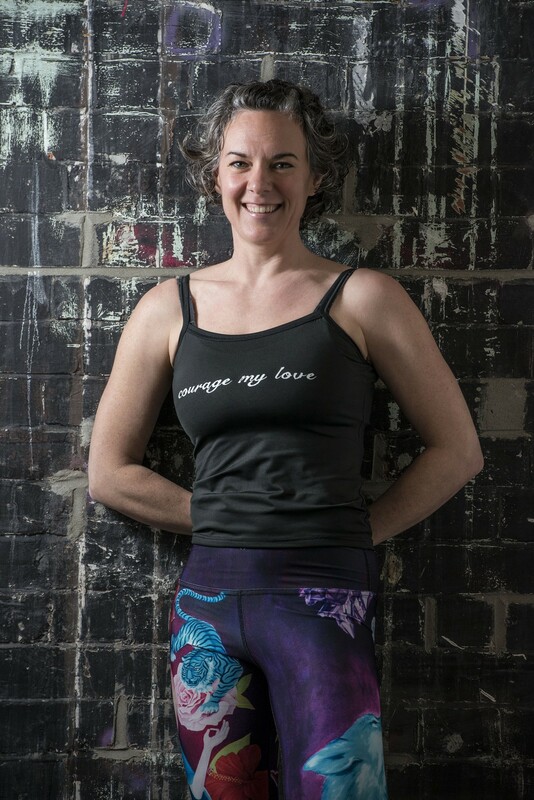 I started Courage My Love because I felt there wasn’t any gear that could take my sense of creative expression to the yoga mat. I didn’t want to buy into the hippy fluffy designs, I wanted to bring in the more edgy/arty expression. I also wanted quality workout gear that could suit all my forms of exercise without deteriorating. From yoga, to running, to weights training. Transformation is part of the yoga practice, letting the blood sweat and tears come through the yoga can be a catalyst for rage, pain and passion, but we don’t see this in our apparel. I believe all of fitness needs a dose of creativity, imagine what happens if artists have a say, what is their interpretation? 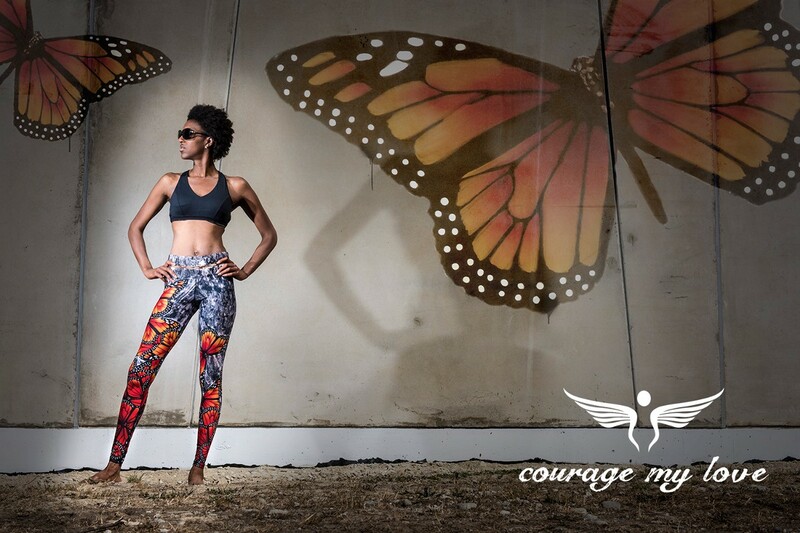 We could see more authentic expression and creativity in our apparel, which is why I started Courage My Love. 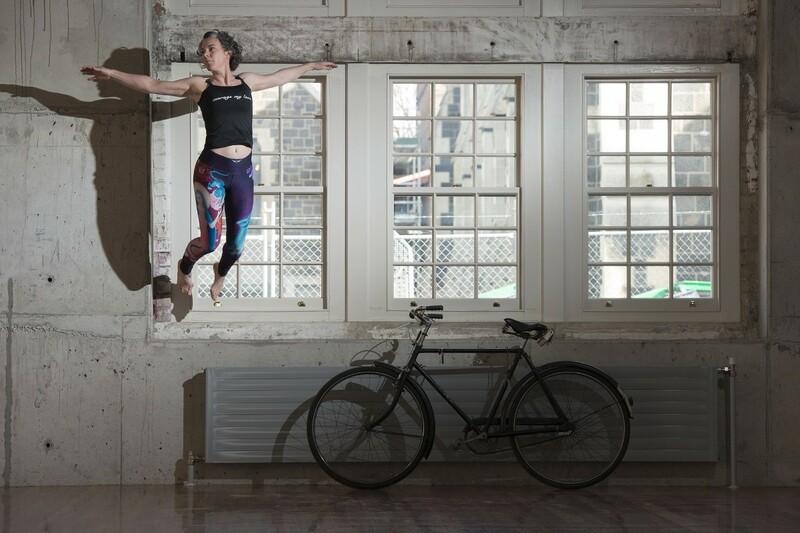 Connection is a big part of my inspiration, whether I’m doing yoga, or making something creative, the connection is at the heart of what I do. Artists are really blessed because they can express the connection, the feelings, they tap into through their creative process and share it with others, that is a brilliant gift. When I work with artists part of the brief is that they are only to work on their artwork when they are feeling in the flow, as soon as it turns into business I ask them to stop. I want to capture the raw essence of that connection, so when people wear it they feel it and get it. 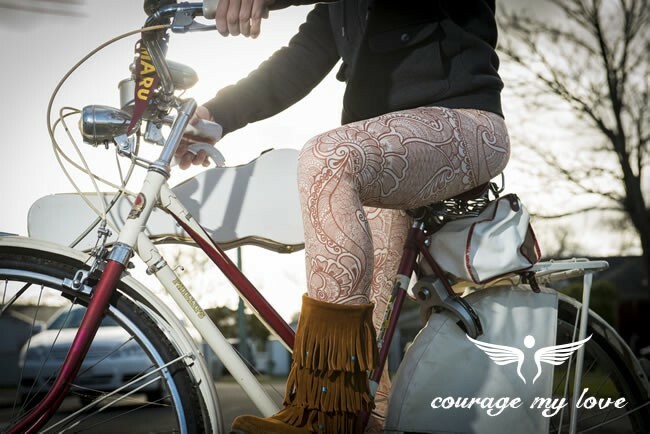 The Legskins we make are just a vehicle to connect with the artist’s creative expression. Tell us a little about your process. Artists apply and I commission them to come on board through an interviewing process. I work closely with the artists because of my technical understanding of the garment. But in terms of the art work, I have less than 5% input; it is just about directing artists away from seams usually. After we get the completed art work it goes through a rather technical process to become digital. Once digital it goes through another technical process called sublimation, which turns print ink into gas through a heat process which infuses the fabric. Once it has been printed each pair of Legskins are hand cut, and hand sewn in a fitness apparel factor by experts in the industry. The full manufacturing is done in Christchurch. This is important to me, even though labour is expensive here. People are voting with how they spend money, by purchasing mass-produced clothing made in foreign countries there are consequences — there is a loss in quality, accountability and what is really dangerous is the loss of expert skills in our country. When people buy from Courage My Love they are supporting the local manufacturing industry. Where did the name for your business come from? And what made you become your own boss? Before the earthquakes I’d been in property development. In the February 2011 earthquakes I lost my home, I was in the hospital with my 4 year-old son who was fighting an immune disease, and at the time my marriage was not going well. It was a hard time. After the several minutes of shaking, everything fell over, my marriage, my business, but luckily my son’s health improved, and now he is back to normal. Courage was basically an absolute necessity — I had to face all of those things in that one day, let alone the years that followed. I knew that anything I did had to be rooted in Love, it was like someone flicked a switch and suddenly the lights went on, none of that physical accumulative social status stuff was what life was really about. It was then that I started Courage My Love. From then on my gift and artistry has been based in Love. Where a lot of people felt hard done by, I felt freedom. I felt like I could do anything, the things that were holding me down, were gone, it was not that it was not scary, but I felt like I could connect with the excitement for starting over. Last year I invested several thousand into the internet marketing and I got zero conversion rate on that, I consider that to be a failure. I learned a very valuable lesson, in my naiveté I thought that if I paid this money to these people my business would be successful. But the grass roots campaigns that I personally did were far more effective and powerful. The marketing was out of alignment with the brand, and by paying them I gave my power away, it was not the right thing to do and it was an expensive lesson. What has been your proudest/favourite moment since establishing your practice/business? Last summer I had a stall at a special artisan market, this lady rocked up and she was absolutely wide eyed and breathless — she had come from Rangiora because I had posted that I had some stock on sale and would be at the market. In near desperation she said ‘is anything left?’ I did not even know her, she just loves Courage My Love so much that she packed her kids in the car and drove an hour to buy her second and third pair — she is totally in love with them. That feels like success to me, she gets it. What is the collaboration like with the artists you work with? It is a real give and take relationship, my role is to make the boundaries clear, so there are no questions for the artists and they know where they stand. It is about creating a container where they can shine. When I walk away from a work with an artist, it is like we have had an intimate exchange or a relationship — they hold a special place in my heart, it is way more than just a business relationship. I feel especially connected to the artist forever after. What you have to offer is unique, and it can be scary to stick to your own self-expression, but the originality of your own self-expression is what people are hungry for. It is truly hard among the mass media / marketing to be seen. But artists have the gift to express their authenticity through this noise. We look around at the world outside of us to give us a sense of what is ok in our personal expression, ‘I should wear black because everyone else wears black’, we identify ourselves by our environment. This can make sharing your own self-expression scary. Immaculate conception for me is about holding a concept for what you do immaculately. Business is hard, part of owning a business is about sticking to a resolve, and no matter who has ideas/opinions about my business, it is ultimately my ability to hold the concept with resolve.